The mission of the Superyacht Racing Rules Committee is to address all issues pertaining to the Racing Rules of Sailing (RRS) and superyacht racing. The committee’s actions will include evaluating the RRS Appendix SY (the RRS appendix for superyacht racing) and recommending changes or additions when deemed in the best interest of safe and fair racing. An additional role is to help provide further clarity and amplification to competitors on the interpretation of the Appendix SY. The committee will also review and provide feedback to organizers on RRS Afterguard Members and Communications Officers policies and procedures. Over seven years ago and with the approval of World Sailing, the Racing Rules of Sailing (RRS) Appendix SY made its debut at the 2011 St Barths Bucket. At that time, there was apprehension on how the 40 metre addition to keeping clear or giving room, and the restrictive overtaking provisions would work on the race course. Fortunately for superyacht racing, the fundamentals of Appendix SY have stood the test of time. In subsequent years, there have been a number of minor changes and improvements made to the appendix. Review and refinements to the Superyacht rules continue. Recently, four members of the SYRA’s Superyacht Racing Rules Committee met in Porto Cervo during the Rolex Swan Cup. They addressed two issues that have been raised in recent years: ‘overtaking’ and ‘continuing obstructions’. Three International Judges, Jim Capron, Gordon Stedwick and Willii Gohl, were joined by experienced superyacht navigator Nacho Postigo to tackle these important topics. Through several meetings during the regatta, the SYRA RRC members agreed to new wording to the superyacht version of rule 17.2 ‘proper course’ (Appendix SY 2.8). This new wording will be submitted to World Sailing’s Racing Rules Committee during their 2018 AGM later this month in Sarasota, Florida, USA. With the approval of World Sailing, this new wording in Appendix SY will appear as changes in 2019. SYRA will provide the specifics on the changes to the rules in the next issue of the SYRA newsletter along with two new case studies. The new case studies will analyze the issues in overtaking to windward and overtaking to leeward. The committee members also held extended discussions on the interpretation of ‘continuing obstruction’ which regularly applies when racing around the island of St Barths or the Archipelago in Costa Smeralda. The committee decided to produce a case study before the 2019 winter circuit. The objective is to address which rules apply when approaching and rounding an island that is a mark of the course and which will become a continuing obstruction when boats are passing it. If you have any questions for the Superyacht Racing Rules Committee or would like to provide input on any issues pertaining to the rules, please email us anytime and we will forward to the committee chairman. Current case studies are posted here. With high tonnage, there are long-game tactics to consider, but in high-stakes, high-ego superyacht racing, it’s never as simple as it appears. Read more here. The purpose of this memorandum is to update those involved in superyacht racing with regard to the very latest information on the issue of banding spinnakers and other sails. Superyacht event organizers were put in a difficult position when ISAF created and implemented RRS 55 (background information provided below). Beginning with the Loro Piana Superyacht Regatta in Virgin Gorda (March 2015), superyachts should be prepared to race without ‘banding’ sails – with elastic, wool or any other material. Sailmakers are aware of Rule 55 and have been working on alternatives to banding (socks, zippers, Velcro, etc.) for some time now. The SYRA and event organizers are intent on “doing the right thing” for the environment and want to avoid a potential last minute directive that may leave competitors with no banding alternative. By way of this communication, we are relaying the intent of the organizers of the YCCS regattas, Bucket Regattas and Superyacht Cup Palma to adhere to Rule 55 in their 2015 regattas. This provides an additional six months for sailmakers and racing programs to prepare for the two March events. 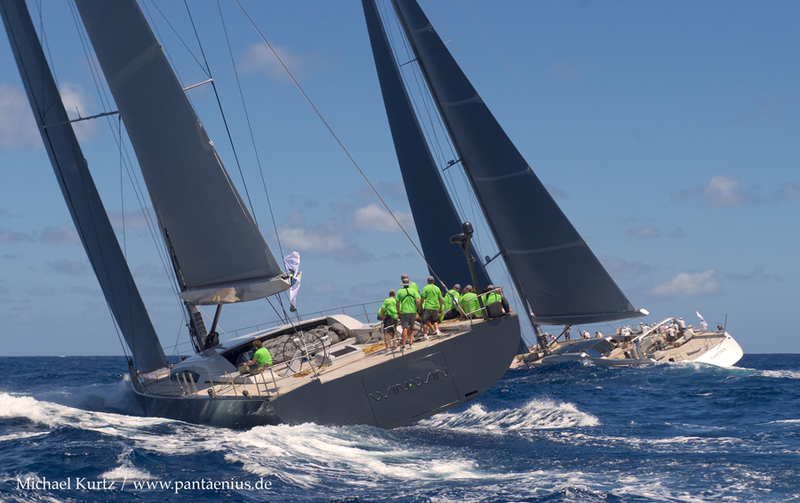 For the Antigua Superyacht Cup Regatta, the time frame leading up to that event is significantly shorter and hence the organizer is considering alternatives for their 2015 event. Feel free to contact us and/or any of the organizers directly with any questions or concerns you may have. Given the lack of notice, it was not uncommon to see this rule change in event documents for regattas with large yachts, and it has generally gone without much notice over the past year. However, at a recent major event, which used the language from the Q&A, the organizer received a directive from the local environmental authority that it would need to change the event’s documents and prohibit the use of banding or the organizer could be held responsible for violating local environmental laws. The latest version of Appendix SY is on the ISAF website.